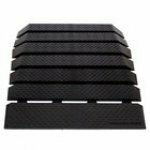 Rubber Threshold Ramps provide a durable, safe means of navigating uneven household surfaces including small steps and doorways. A hidden dovetail locking system allows for easy installation and incremental ramp height adjustment of up to 4 inches. - This product is made from recycled natural rubber which may contain latex and could cause an allergic reaction in some individuals. Rise Length Usable Width Overall Width Weight of EACH PC. 1" 10.4" 36" 39" 10.2 lbs. 1.5" 6.9" 36" 41" 11.4 lbs. 2" 6.9" 36" 42.5" 13.2 lbs. 2.5" 7" 36" 44.2" 17.2 lbs. 3" 7.5" 36" 46" 22.6 lbs. 3.5" 7" 36" 46" 27.2 lbs. 4" 7" 36" 46" 28.6 lbs.